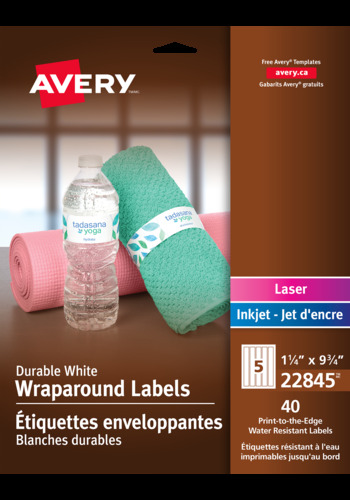 for Laser and Inkjet Printers, 9¾" x 1¼"
Offer your customers something more by showcasing your brand with these versatile Wraparound Labels. Their water-resistant material and permanent adhesive make them perfect for branding water bottles. They're also ideal for use on products, packaging, marketing materials and more to make your brand or logo really stand out in the crowd. Offer your customers something more by showcasing your brand with these versatile Wraparound Labels. Their water-resistant material and permanent adhesive make them perfect for branding water bottles. They're also ideal for use on products, packaging, marketing materials and more to make your brand or logo really stand out in the crowd. The print-to-the-edge capability lets you apply bold colours and sharp text all the way to the edge of the label to vividly showcase your brand logo, product name and more. Water and scuff resistant for a clean look and a permanent adhesive to ensure they stick to glass, plastic, paper and other materials, so you can put your mark on nearly any product. Label Size 9¾" x 1¼"